"Coffee Crazy and a good groove... Robert Galinsky has percolated a double-dosed funky brew." "Written for anyone interested in how to work smarter and play more joyfully! A great gift!" "It's definitely the most outrageous coffee book ever written." "Coffee Crazy is brimming with whimsy, sound advice and curious quotes... It's a great purchase!" "A little fun mixed with a little philosophy." “Galinsky does it again... concise, fun-to-read, tweetable!" "Author brews frothy mix of coffee, celebrity, and Twitter." "Reading this book was sheer pleasure. If you love coffee, buy this now." "If Robert Galinsky is doing it, it’s never been done before." Author, speaker, coach and New York City performance personality Robert Galinsky encapsulates the passion of millions of coffee lovers in a single cup-sized book and shows that coffee can be a medium for powerful positive social interactions and aspirations, and also a magnificent and intimate way to connect and relate to others. Coffee Crazy is part inspirational reading, part guidebook for better communication, part poetic literature, and part casual coffee talk with designs on personal and professional growth. From families, foodies, entrepreneurs, celebrities, corporate executives, to thought leaders; this book dares to dream about the next big idea in corporate break rooms, cafes, restaurants, and in the home. Whether you’re looking to expand your horizons about coffee, deepen your appreciation for interacting in with co-workers, or understand how coffee can be that one element that brings people together, Coffee Crazy is the right book for coffee lovers and coffee enthusiasts. Coffee Crazy is part of the THiNKaha series whose slim and handy books contain 140 well-thought-out quotes (tweets/ahas). 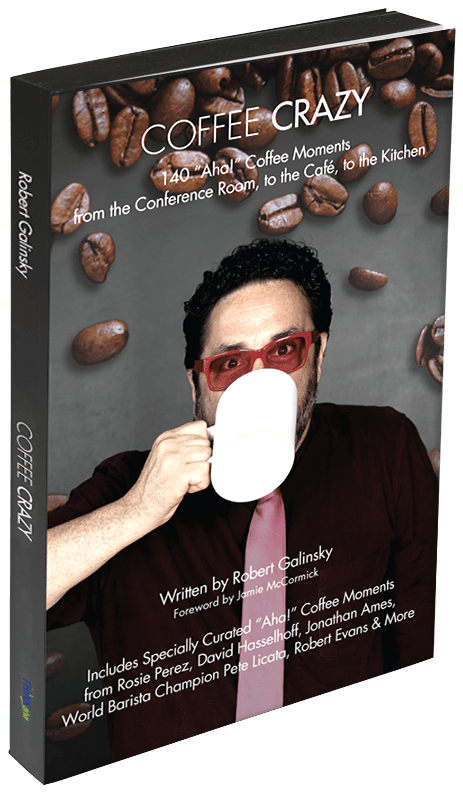 We're celebrating the release of Robert Galinsky's first book "Coffee Crazy 140 aha! Coffee Moments from the Conference Room to the Kitchen to the Cafe". Click here for details and to RSVP. © Copyright 2013 Robert Galinsky. All Rights Reserved. Site design by Big Tree World.